Harribobs? Not quite a new name as we have his ‘What is the Word?’ in the current (October) Magpie, and struggled to draw that spade in Jake’s Treasure Hunt on Derek Harrison’s Crossword Centre last month but this is a first Listener so I rather anxiously have to confirm that Harribobs qualifies for the Listener Setters Alcoholic Haze Club. He leaves me in little doubt as after a brief visit to the shopping centre, ‘Dashed small dog attempted to leave shopping centre (8)’ (SMALL CUR [T]RIED less MALL = SCURRIED) we find ‘Many going after American wines (7)’ (Well, who wouldn’t in a mall? We are due to visit the Napa Valley in a couple of weeks’ time and I can’t wait to taste the Zinfandel – my favourite). However, this gentle little clue deceptively leads us to our local stuff [A]MER(ican) + LOTS = MERLOTS. The boozy clues continue with ‘Will always heading for saloon bars (6)’ ([L]L + EVER + S(aloon) = LEVERS) then, not surprisingly, ‘Drunken centaur emits a belch (5)’ (CENTAUR less A* = ERUCT). The drinking continues with ‘Dry run waived by mounted army? (4)’ ([F]ORCES less R(un)< = SECO) – so Harribobs has started to mix the reds and whites and perhaps not surprisingly we find ‘Top defenders renouncing suggestion of strong alcoholic drinks (9)'(LI[D] + BASTIONS less S(trong) = LIBATIONS). 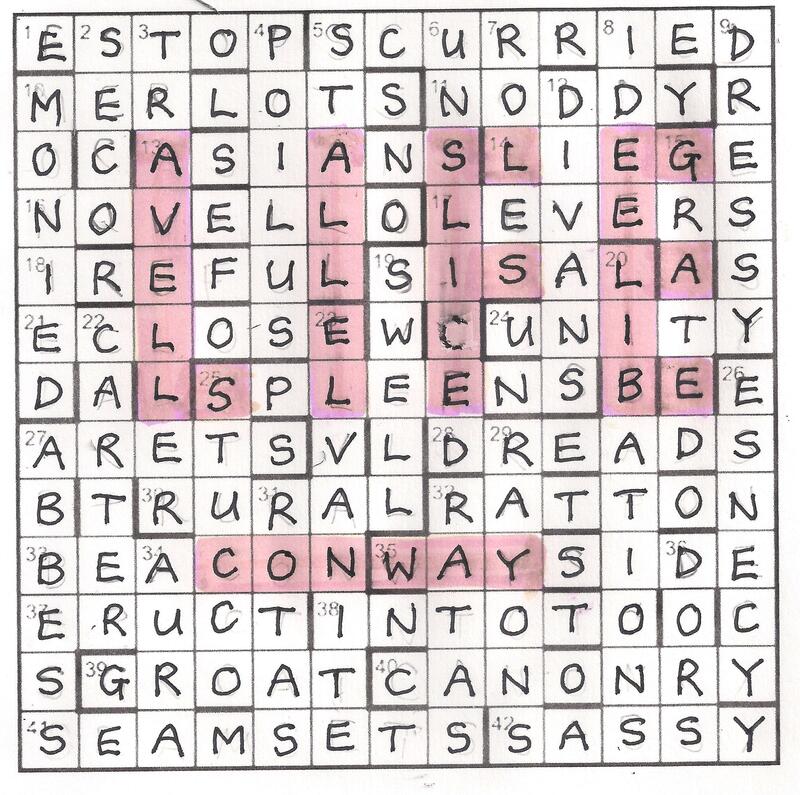 This crossword is flowing with alcohol – (see you in the bar next March, Harribobs!) but also with a lovely set of solvable clues and our grid fills steadily with a message appearing: START CELLS HAVE ELEMENT OF LIFE, SHADE SECOND GENERATION. We had understood from the preamble that we were going to play a game with the completed grid and the rules were laid out clearly, though I managed to bungle by adding a generation at the start while the other Numpty, a new man, cooked supper. Fortunately, he managed to apply the rules correctly and, in the meantime, I cheated and found a simulator on-line that did exactly what he was doing and produced the word LIFE as the second generation. Wikipedia also told me that CONWAY created this game, and, sure enough, almost symmetrically, there he was in our grid. We had, of course, noticed that there was a minor unching aberration in the initial grid (where SASSY and ESTOP had two unchecked letters out of five) and know that the editors would not let that through without good cause. Now, seeing that astonishingly neat endgame, I was amazed that there were not more unching aberrations and do hope that Harribobs will br giving us a setter’s blog to explain how he managed to perform this feat. What a stunning début. Many thanks to Harribobs. This entry was posted on 6 November 2015 at 4:00 pm	and is filed under Solving Blogs. Tagged: Harribobs, The Name of the Game. You can follow any responses to this entry through the RSS 2.0 feed. You can leave a response, or trackback from your own site.